A friend of mine sent me a string of dosa recipes, of which I shall share a couple of unusual ones here. Enjoy! 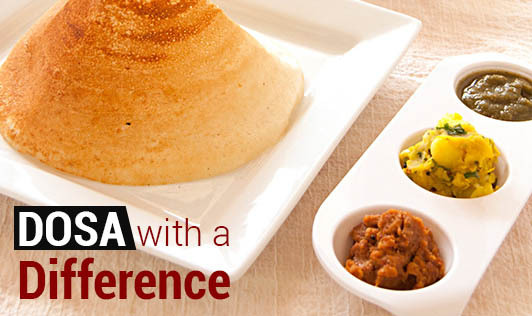 If you have any interesting dosa recipes, do share it with the readers. Grind with tofu to a fine paste. Add water to make the batter thinner than normal dosa batter. Heat a non-stick tava and splash the batter on it. Cook for 2 minutes and turn it over carefully. Serve hot with chutney or stew. In a bowl, mix well with water, all the ingredients to make a batter consistency. Keep aside for 5 to 10 minutes. Heat a non-stick pan, pour and spread the batter to make a dosa. It can also be eaten without an accompaniment.